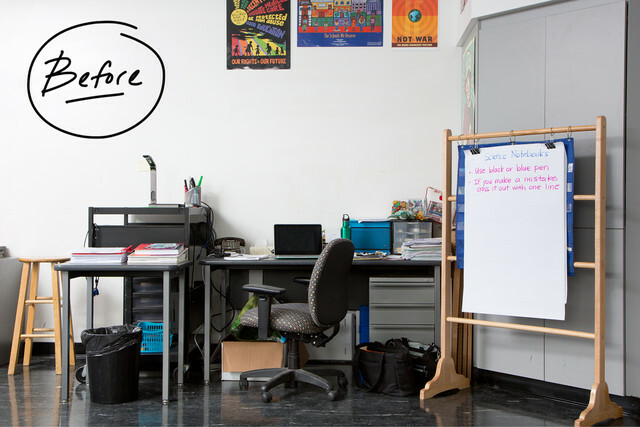 In Janet Lee-Ortiz's 13 years of teaching, she had never found an organization system that worked for her. 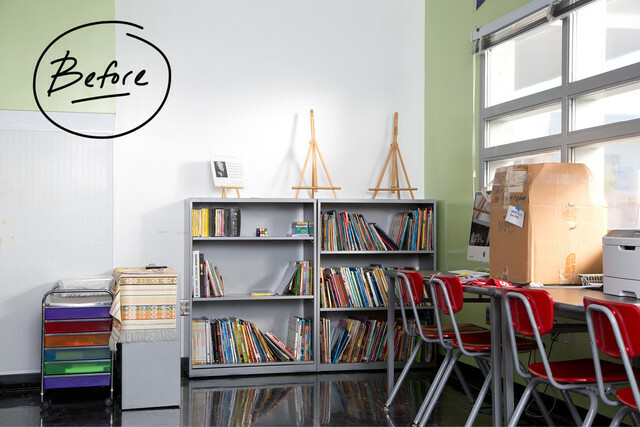 But when she was preparing to move into a brand new classroom after seven years of teaching at the UCLA Community School (http://cs.gseis.ucla.edu/), she decided she was ready for a change. Janet teaches math and science at this trailblazing school, which promotes itself as breaking new ground in the ways of education. 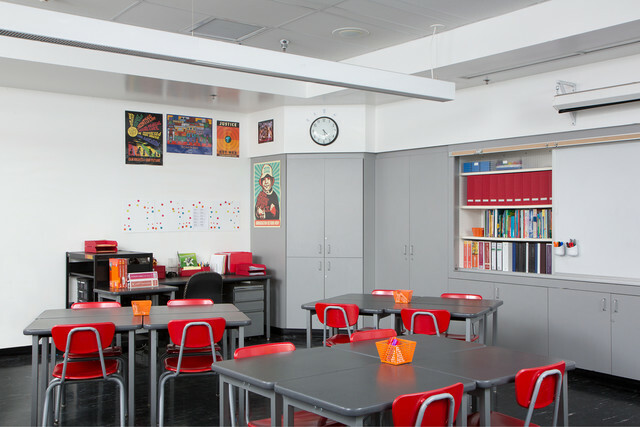 With two classrooms made up of 35 students each, Janet's hope for her new space as she kicked off the school year was an environment where every space was utilized well with the utmost intent, purpose and efficiency. With the help of Jeremy Valadez and Maggie Trifilio from our Farmers Market store in LA, Janet's classroom is now functioning beautifully with her students' stamp of approval! "Every minute and second is precious when teaching," says Janet. 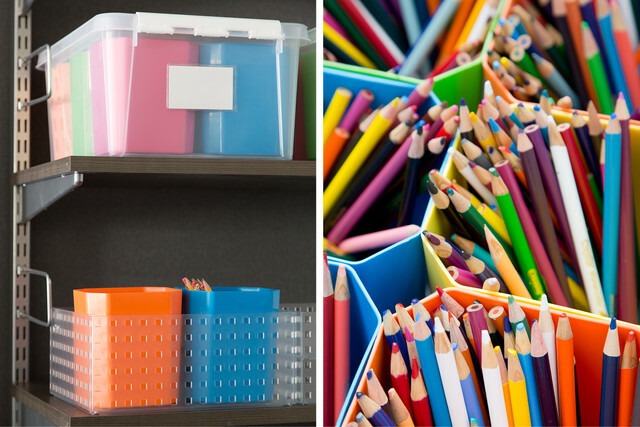 As she started organizing her new classroom, she set a goal to keep everything clean and put in its correct place before leaving for the day. Before, there was no system in place and now, as Janet puts it, "every corner and side of the room is purposely used." Jeremy and Maggie helped Janet sort, categorize and organize the bevy of books, study guides and other resource materials that are stored away in a closed cabinet. 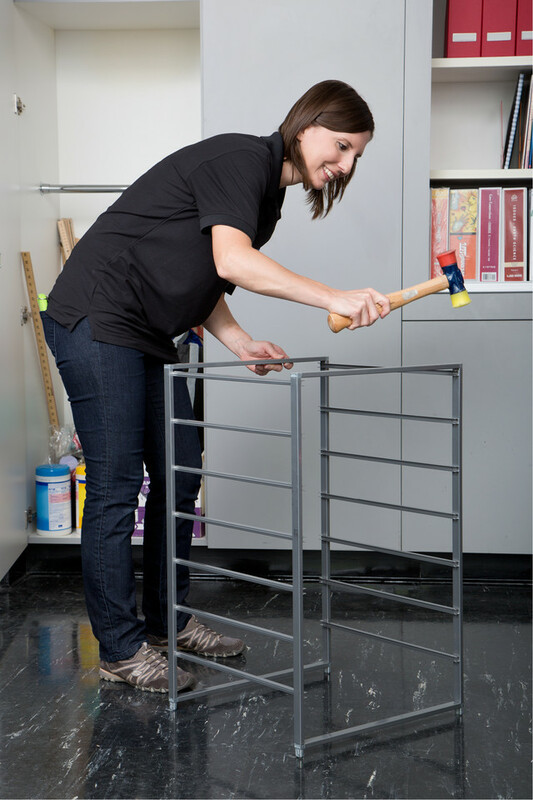 As we always say, one of the most important steps in organizing a space is to survey what needs to stay and what can go. Then you can store like-things together with a system that is intuitive for you. Janet loves her new desk area! She now has several of our Magnetic Boards, which not only hold all of her notes, but also the dates of all her students' birthdays! 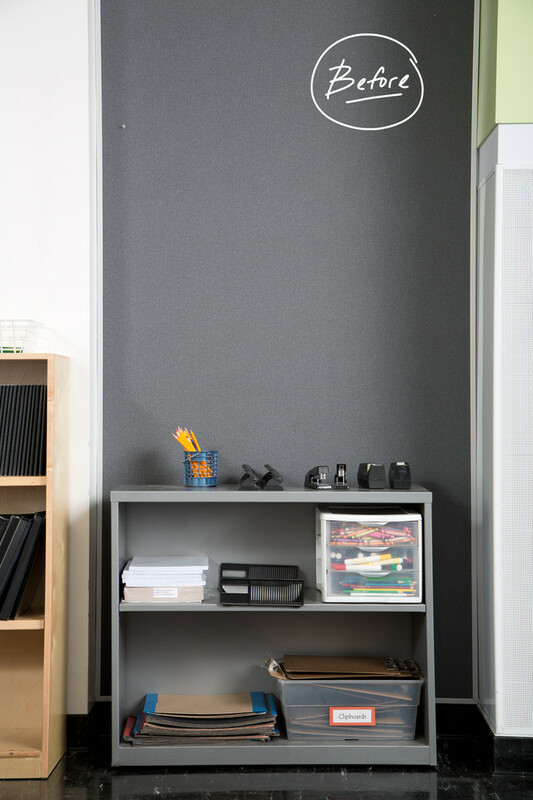 Janet's desk area is organized and efficient with her files accessible for the first time. 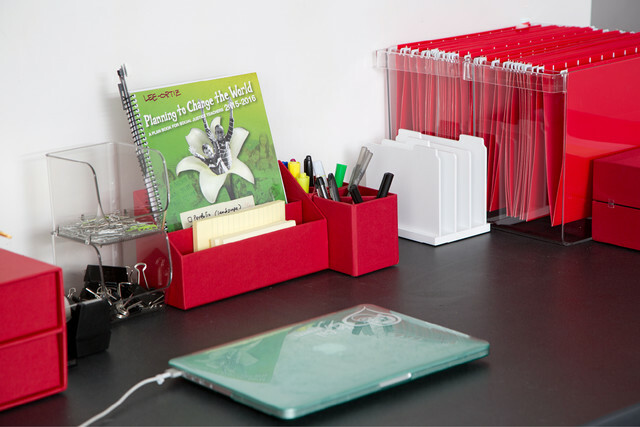 She says that our Tab Sorter is "life-changing, and was a must-have in the new space." 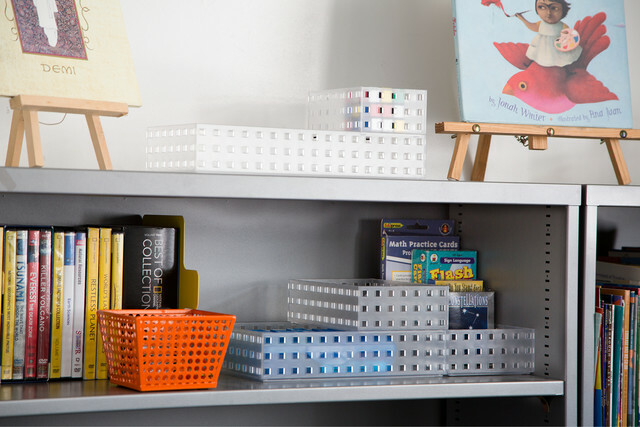 She uses it to organize the many clipboards she has for her various lessons. 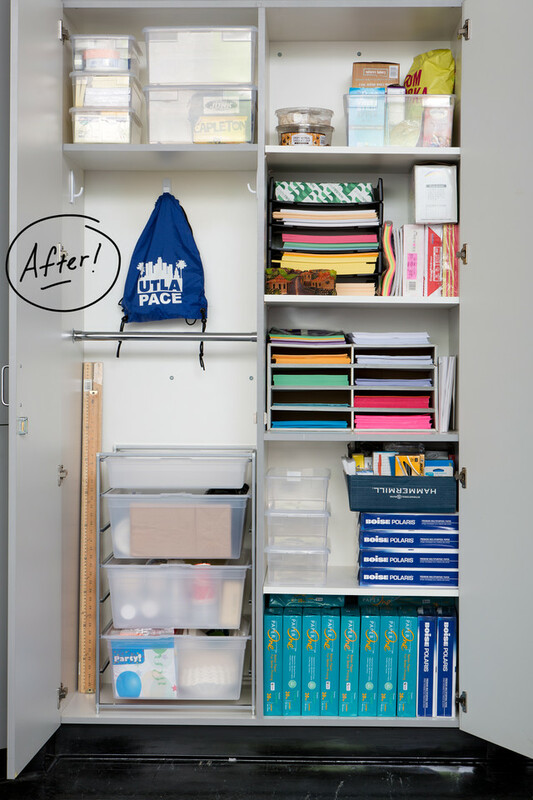 A closed supply closet had a lot of wasted space before. 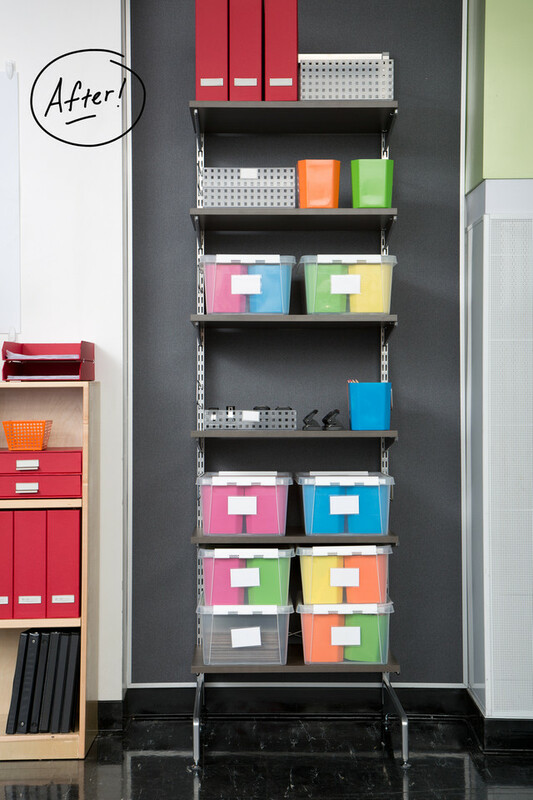 The area is now better utilized using an elfa drawer unit and a combination of hooks, clear bins and paper sorters. Janet says the elfa unit is now one of her most frequently used items. She says she puts her bag in the top drawer and she loves the translucent drawers because they corral her belongings while still being visible. 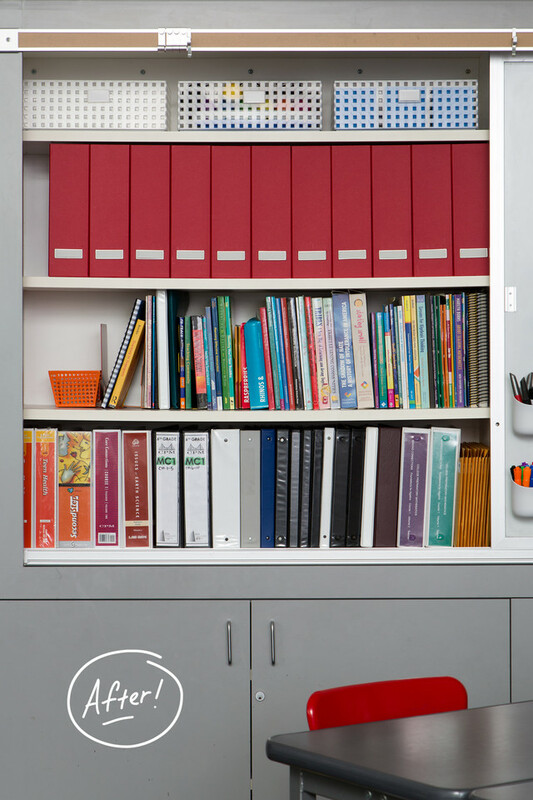 An elfa freestanding unit takes the place of a basic bookshelf and maximizes vertical space to hold supplies in our Smart Store System. 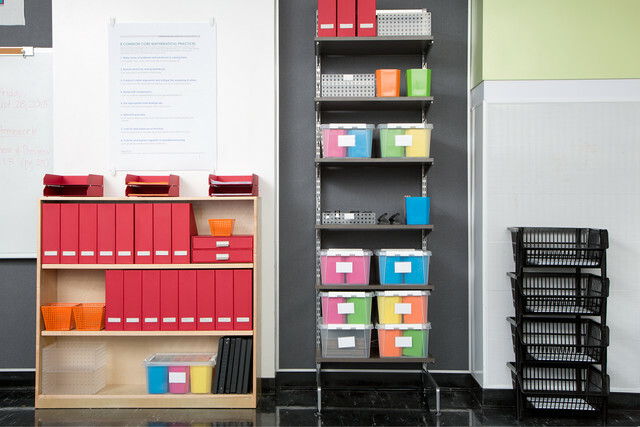 Janet says supplies are labeled for the very first time, and now students can easily see where scissors, colored pencils and paper are stored, and get to them quickly. 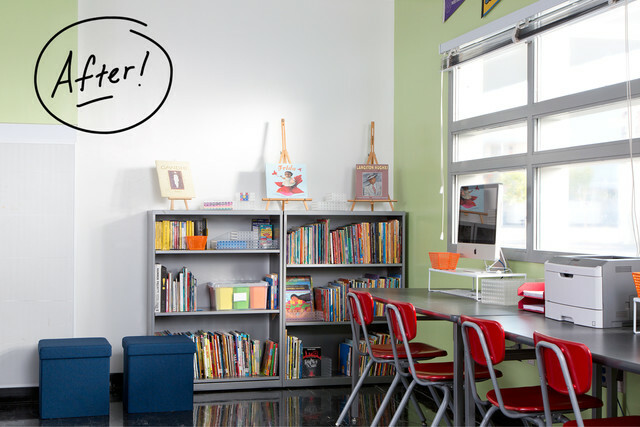 The pops of bright color make the classroom inviting and fun for her students. 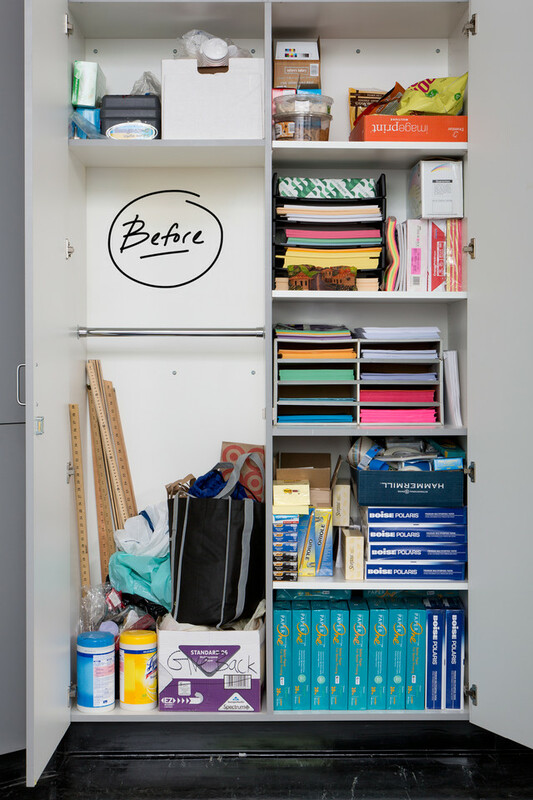 Labeled magazine files organize student team binders for science. 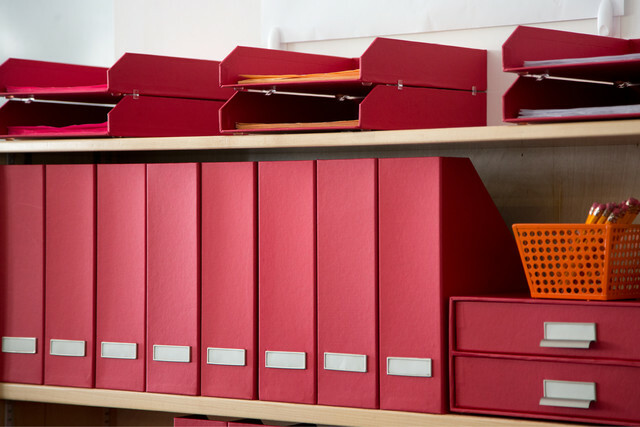 Janet says it saves time and the students are able to find their specific binder much easier. 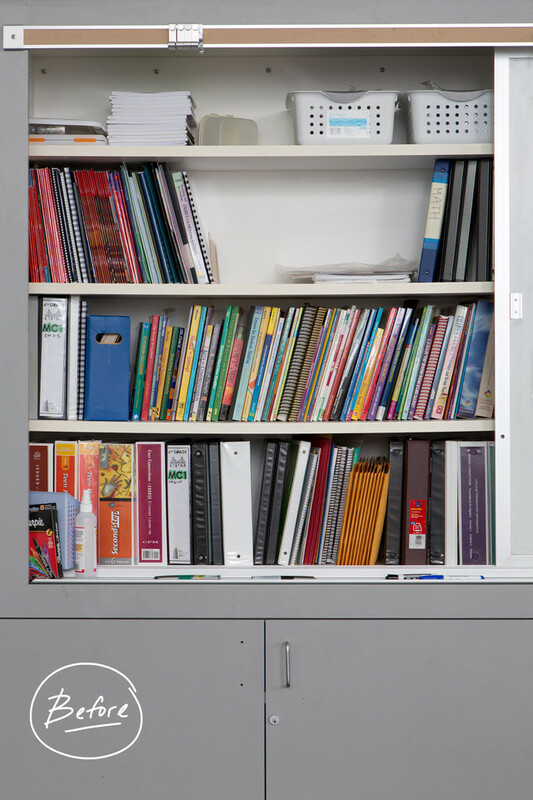 "In previous years, students would have to dig through piles to find their binder," says Janet. 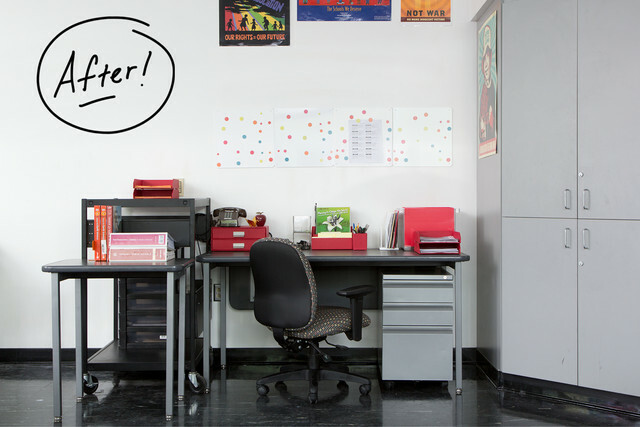 Visibility, flexibility and accessibility are abundant in Janet's new space. She says the students saw the "before," as the makeover happened the first weekend after school started. She says they were very impressed with the "after" - so impressed that they immediately wanted to look through the books because they were so visible! Immediately wanted to start reading when they walked in? Sounds like the makeover made the grade! Here's to a fabulous school year for Janet and her UCLA Community School 6th graders!